A Senate committee approved three of President Bush's judicial nominees, overriding Democratic attempts to delay a vote as they have with the nomination of Miguel Estrada to the federal appellate bench. Thursday's vote in the Senate Judiciary Committee sent U.S. Appeals Court nominees Deborah Cook and John Roberts to the Republican-controlled Senate, despite Democrats' objections that they had the right to continue holding the nominees in committee. Democrats had agreed earlier to allow the appellate court nomination of Jay Bybee to go through. Democrats complained that the committee's chairman, Sen. Orrin Hatch, R-Utah, overrode committee rules to force the vote. Hatch said he was within his rights to do so. "We're not going to have filibusters in committee," an angry Hatch said at the end of a three-hour hearing in which he exchanged sharp words with Sen. Edward Kennedy, D-Mass. Democrats at one point walked out of the hearing to prevent Hatch from having enough committee members present to vote. "You may bully some but you're not going to bully me," Kennedy told Hatch. For three weeks, Democrats have held up a confirmation vote on Estrada's nomination by threatening a full-blown filibuster. They argue that Estrada, who has never been a judge, lacks the experience necessary to join the appeals panel that is seen as a stepping stone to the Supreme Court. Democrats also contend that they cannot evaluate Estrada's temperament because the administration refuses to release briefs he wrote while working for the Solicitor General's office. The administration insists those documents are exempt from disclosure rules because they involve legal advice. Sen. Patrick Leahy of Vermont, the lead Judiciary Democrat, said Hatch was ignoring committee rules that require a Democrat to agree to end a committee filibuster. 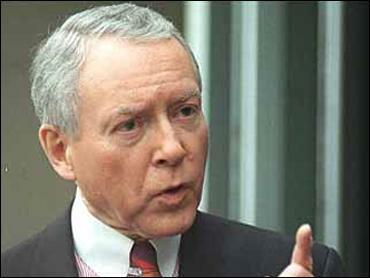 Hatch said Senate parliamentarians informed him that as chairman he could force a vote on the president's nominees. According to the rules on the committee's web site, "If there is objection to bring the matter to a vote without further debate, a rollcall vote of the Committee shall be taken, and debate shall be terminated if the motion to bring the matter to a vote without further debate passes with ten votes in the affirmative, one of which must be cast by the minority." Cook, an Ohio Supreme Court justice, was approved by the committee by a 12-2 vote, with the rest of the Democrats passing or voting "present" to reserve their right to bring the issue up on the Senate floor. Roberts, a Washington appellate lawyer, was approved by the 19-member committee by a 14-3 vote, with the rest of the Democrats passing or voting present. The committee also sent the appellate court nomination of Bybee, a Justice Department lawyer in Nevada, to the Senate for confirmation by a 12-6 vote, with Leahy again voting present. Democrats say they didn't have enough time to question Cook and Roberts during their original confirmation hearing because Hatch had three federal appellate candidates at the same hearing, instead of considering them one at a time. Liberals have accused Cook of ruling with business interests too much as a judge, and Roberts of opposing abortion rights, affirmative action and environmental protection laws. On the Senate floor, Democratic leader Tom Daschle of South Dakota criticized Hatch, saying the committee maneuver "would not be tolerated." Mr. Bush has called it a "travesty" that Democratic senators have refused to allow a full Senate vote on Estrada's nomination to the U.S. Court of Appeals for the District of Columbia. Judicial nominations have become increasingly contentious matters on Capitol Hill. Democrats are accusing the GOP of rushing conservative nominees through the process, just as the White House claimed Democrats stalled conservative nominees when they controlled the Senate. The Clinton administration made similar charges against the Republican-led Senate.